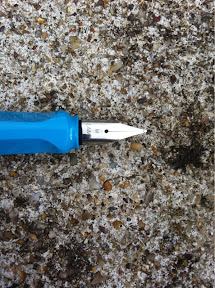 I managed to get hold of a new Lamy safari Fountain Pen in glorious Aquamarine. This is a special edition colour and will only be available for a limited run. I absolutely love Lamy Safari pens! They are virtually indestructible and although meant as a child's pen, they are more commonly seen in the hands of bigger children - if you know what I mean. My favourite colour has of course always been the orange version but I have to say this new colour looks so good I have changed my mind. I have pens that cost over £200 from such names as Pelikan, Mont blanc and Duofold but compared to the humble Safari they are, well, boring. 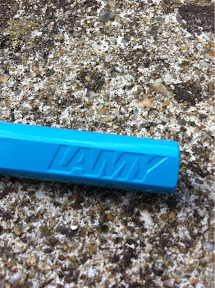 The other really good thing about these Lamy pens is that if you get fed up with a particular nib width you can choose from lots of different types and fit it yourself in less than 30 seconds. In addition they only cost about £4. 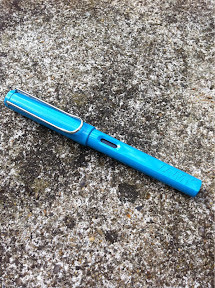 Lamy Safari fountain pens, ball pens and pencils are available at most high street stationers and specialist pen shops. Definitely give them a try. You're sure to find one that colour coordinates your Brompton or whatever else you're wearing.